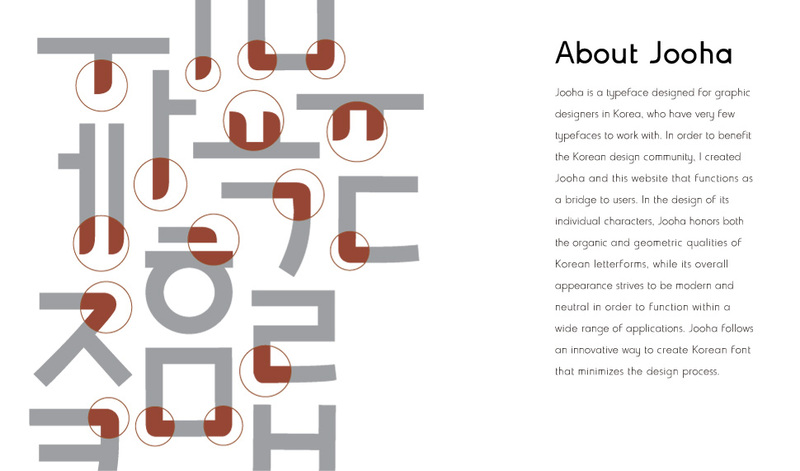 Jooha is a typeface designed for graphic designers in Korea, who have very few typefaces to work with. In order to benefit the Korean design community, I created Jooha and this website that functions as a bridge to users. In the design of its individual characters, Jooha honors both the organic and geometric qualities of Korean letterforms, while its overall appearance strives to be modern and neutral in order to function within a wide range of applications. Jooha also follows an innovative way to design Korean font, that minimizes the process of designing Korean font. This will be explained furthur in Structure.